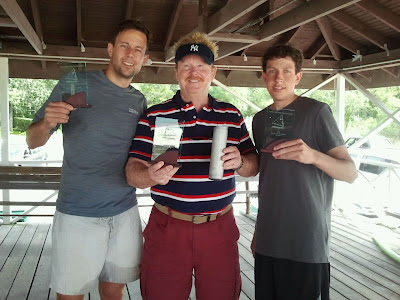 The fourth and last sunfish regatta was concluded on Aug 19th in light winds. A total of twelve individual races were held through July and August. The "hard luck" award was earned by Steve Pierce, whose mast broke on the third day of racing but continued on with a shortened mast and a lot of determination. The third place trophy was presented to Greg Petrillo, who received the "most improved" award last year and in one years time morphed from a novice sailor into a skilled racer both in heavy and very light wind. Second place trophy went to Chris Hogan. First place honors , along with his name on the perpetual trophy , was earned by Steve Pierce. Steve was sailing the same sunfish that his father sailed forty years ago. A big THANK YOU to John and Frank Petrillo for bring back the Sunfish regatta tradition to Southampton Shores. It was initially started over 45 years ago by Tulio Rosetti. The Petrillos would love it if we could get some more young kids interested in joining our fleet. It's a lot of fun!